As fellow Torontonians may be aware the Toronto Film Festival is currently underway, the fest runs from Sept 5 to Sept 15. In that short amount of time movies stars, directors, producers and the like flock to Toronto for the event. For the film buffs or celebs stalkers this time is heaven for them. I myself am not a huge movie buff or a fan of celeb stalking so I can't say that I really pay too much attention when TIFF takes place. 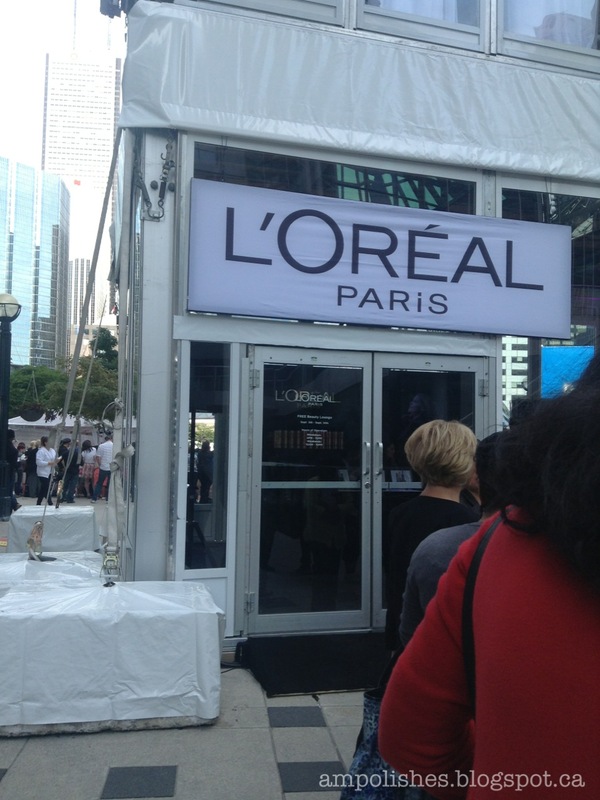 Now if some of you are not aware, L'Oreal Paris is actually a big sponsor for the event and while the festival is running they've set up a free beauty bar in David Pecaut Square on King St. I had the chance to drop by today and wanted to share my experience with you all. The beauty bar offers nail, lip or pony tail service for no charge. 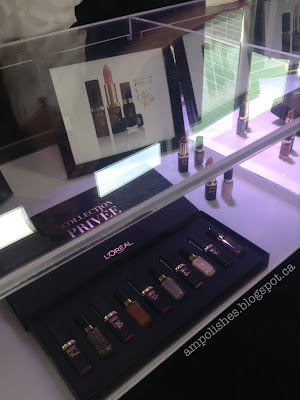 You are given the option to choose one of the three services, the products they used for the nail and lip bar were from their recently released limited edition Collection Privée. Click to see which beauty bar I chose and what I got to take home with me! Being a polishaholic I chose the nail bar, they only had 4 out of the 5 shades from the collection to choose from. I ended up picking JLo, a neutral greyish purple shade (one of my fav shades). The girl had time to do 2 coats but I think we could've gotten away with just 1. The polish applied really well and was very pigmented plus it dried fairly quickly. 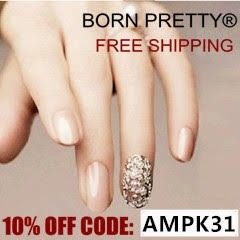 The best part was I got to keep the polish she used for my manicure :D Who doesn't love free things? At the end of the pampering they had a photo booth where you can take home some pictures to remember your wonderful time at the L'Oreal beauty bar. Also, if you chose the lip bar you went home with the tube of lipstick you used or a can of hairspray if you chose the ponytail bar. I must say the lipstick packaging is gorgeous! The beauty bar is kind of tucked away in the back of the square and not too easily seen from the street. There was a line up to get in and it was a little slow moving but to be far the beauty bar itself wasn't very big. There was only one person at each station doing the lipstick application, nail polish application and ponytail tying. 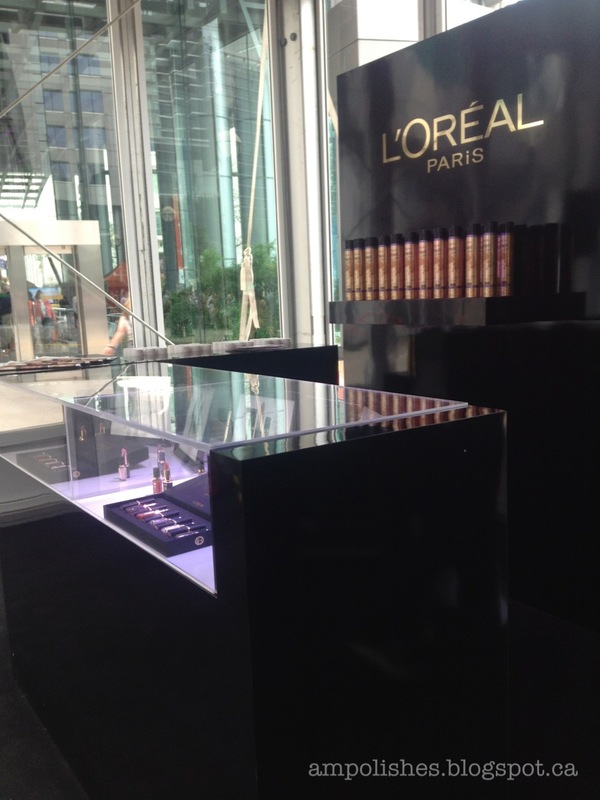 The beauty bar is open until Sept 14. Have you attended TIFF or any film fests? Any movies you're dying to see? Do you own any Collection Privée polishes or lipsticks? Which shades caught your attention?